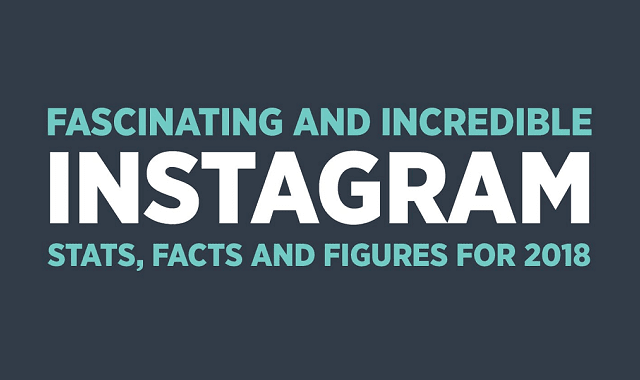 Fascinating and Incredible Instagram Stats, Facts and Figures for 2018 #Infographic ~ Visualistan '+g+"
Social media is definitely a great way to build brand engagement and awareness. Instagram alone, one of the fastest growing social media platform, now has over 1 billion monthly active users, and it shows no signs of stopping. Have you ever thought about marketing your business on Instagram? Do you want to become Instagram famous? Check out some of the latest eye-opening statistics, facts and figures about this most-popular-among-yong social platform to help guide your marketing strategy. As of this June, Instagram reached a cornerstone of over 1 billion active monthly users, which is over 1/3 of the entire world population. Instagram is growing five times faster than the total social media usage in the United States. Instagram users located in the United States spend an average 55 minutes per day on this App, which increased a lot compared to 29 minutes in last September. Businesses love Instagram! Currently, over 70% of companies and brand in the United States operate business accounts on Instagram. And their target customer are on Instagram too! A study shows that over 80% of Instagram users are now following a business account. Instagram is dominated by young users! Most of its users (more than 90% of them) are younger than 35 years old.